Charles Bronson and Henry Fonda in Once Upon a Time in the West. After the phenomenal success of his first three Spaghetti Westerns, director Sergio Leone began looking for another project, though no one would offer him money unless he made another Western. Eventually he agreed and Paramount gave him a Hollywood-sized budget and big-name actors. 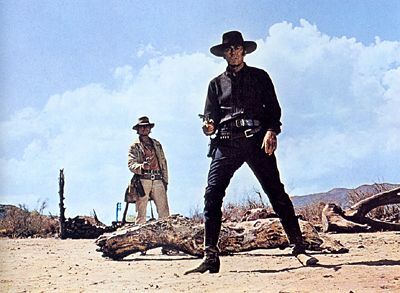 Filmed on location in Spain and in Monument Valley in the USA, Once Upon a Time in the West (1968) bridged the gap between the traditional idealistic American West of John Ford and the cynical, violent Eurowestern. Leone's departure from the traditional American Western is evident in the main title sequence. For nearly fifteen minutes, Leone focuses on three gunmen waiting for a train (an homage to High Noon). One man (Jack Elam) plays with a fly. The second (Woody Strode) stands under a leaky water tower, allowing his hat brim to fill with water. The third (Al Mullock) splashes around in the watering trough. Aside from a few lines babbled by the station master (just before he is locked in an old boiler), there is no dialog or music -- just closeups of faces, exaggerated sounds of the fly, the wind, and a rusty windmill. Bored men waiting for something to happen. The sequence ends when the train arrives and the men violently meet their fate at the hands of a harmonica-playing passenger. The scene's style is as much Japanese as it is Italian -- carefully composed and artfully directed, a study in faces and time. Jill McBain (Claudia Cardinale), a former New Orleans prostitute, arrives at the desert homestead of Sweetwater only to find that her new husband, Brett, and his children have been massacred. While evidence left at the scene suggests the culprit is a bandit named Cheyenne (Jason Robards Jr.), the real murderer is a railroad company employee named Frank (Henry Fonda), working under orders from Morton (aka "Mr. Choo Choo," played by Gabriel Ferzetti). Hanging around also is the enigmatic "Harmonica" (Charles Bronson), who seems bent on meeting up with Frank, and who will reveal his purpose only "at the point of dying." Leone tells his story slowly, deliberately, creating a mythic story of revenge, redemption, and the coming of civilization. Each scene stands on its own, marginally related to the next until we are well into the film. He keeps us guessing until the elements take hold and we begin to catch on to what's happening, how the people and events are related. Why is Harmonica dogging Frank? Why does Frank want Harmonica dead? Why was Brett McBain killed? It's a long, slow and fascinating journey, an epic which pays homage to countless Westerns by John Ford, Howard Hawks, and others without falling into an endless series of clichés. Leone chose Italian film veteran Claudia Cardinale for the central role of Jill. Jill is clearly out of her element in the raw frontier, but she finds support in both Cheyenne and Harmonica. Jill at first doesn't understand the value of Sweetwater (a "worthless" hunk of desert) or why the destinies of Frank, Cheyenne, and Harmonica seem to revolve around it. She falls into a wary friendship with Cheyenne who takes on the role of her protector, even though she is attracted to the mysterious Harmonica. Frank nearly chases her off, but she eventually decides to stay and finish the work her husband had started -- building a railroad station and the town around it. When Henry Fonda first arrived on the set, he wore a mustache and dark contact lenses. Leone was furious, saying he wanted audiences to be shocked that Fonda was playing a cold-blooded killer. It worked, and many critics were appalled that pleasant-faced, blue-eyed Fonda smiles as his character shoots a child in one opening sequence. But Leone was known for turning convention on its head and surprising audiences with his unique vision of the West. Here, he turned a John Ford icon of propriety into a ruthless, ambitious murderer. Frank is a hired assassin who wants to be a businessman but doesn't have the smarts to pull it off. Only his boss understands that Frank and his men are motivated only by money (a fact he uses to undermine Frank's authority over his gang). In the end, Frank is alone, seeking his destiny in the identity of the mysterious Harmonica. After many years as a supporting player, Charles Bronson was offered the pivotal role of Harmonica. His stone face and spare acting style keeps the character aloof and mysterious, though we get the sense of intense underlying emotion. Frank asks him his name, and Harmonica recites a litany of dead mens' names. Later, he is asked why, when he is determined to kill Frank, he saves Frank from his own men. "I didn't let them kill him, and that's not the same thing!" he says furiously. With Harmonica, one always has the feeling that "something's gonna happen." Leone had seen Jason Robards Jr. on the stage in New York, and Robards became his first choice for the romantic bandit Cheyenne. Cheyenne is the source of the film's humanity and its understated humor. He not only acts as Jill's guardian angel, he rescues Harmonica from Frank's men in a gun battle aboard a moving train. Tonino Delli Colli (The Good , the Bad and the Ugly) provided the film's magnificent widescreen cinematography (completely lost in pan-and-scan versions shown on TV). Extreme closeups, carefully choreographed crane and dolly shots, and impressive framing all add to the sense of scope this film offers. Ennio Morricone's score is less flamboyant, more sweeping than his previous efforts for Leone. The main theme (Jill's theme) is slow and soaring, with strings and solo female voice. Frank is represented by an ominous electric guitar, often intertwined with Harmonica's wailing harmonica theme. A bouncy banjo theme accompanies Cheyenne. A sad lament, on oboe and piano, plays for the diseased and dying Morton. In an unusual move, Leone had Morricone record the score before filming had even started. The music was then played on the set in order to get the actors in the right frame of mind and to coordinate camera movements with the score. The result is even more of an operatic feel than Leone's previous films. Though panned by American critics as an exercise in excess, many film scholars now consider this film Leone's finest work. While he liberally applied the conventions he invented for the Spaghetti Western (the explosive violence, extension of time, arty camera work, etc. ), he also gave us a film which stands on its own beside the best from Ford, Hawks, and their brethren.